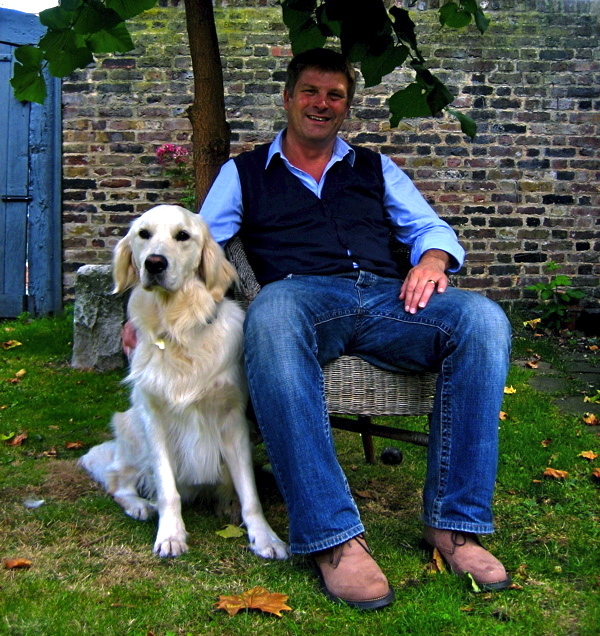 This is Andy Rider sitting peacefully under the Mulberry tree with Archie, his golden retriever, in the garden of his eighteenth century rectory in the shadow of Christ Church, Spitalfields. I was delighted to have the opportunity of tea with Andy at the rectory one afternoon at three o’clock, because, as the one who has been given the “cure of souls” in this parish, he is the man with professional responsibility for my soul. Yet, although Christ Church is one of London’s grandest churches, Andy’s style is a little more relaxed, as signified by the blue jeans in the picture above and the huge dog basket almost filling the hallway, which is the first thing you see when you step through the door of the magnificent rectory. “People ask if it makes me feel small, living here,” he declared, as we strolled through the elegantly proportioned rooms, which seemed a strange question to me since Andy is a tall man, distinguished by a certain physical confidence revealing he is comfortable in his own body and at home in his rectory too. I suppose I had not expected someone whose primary concern is with spiritual life to be so present in the material world, possessive of a strong handshake, an easy smile and a clear blue-eyed gaze. Taking his London A-Z from the shelf, Andy outlined the geography of the parish and listed the various services that he presides over each week, describing the particulars of his employment in exercising the “cure of souls” in Spitalfields. My thoughts were racing in astonishment. Just minutes earlier, he had been searching his A-Z and we were discussing the new ipad, but now our conversation had entered another realm, yet a realm which for Andy carries equal reality. I do not know why I found his testimony shocking or why I was surprised to hear a priest tell me he believed in God. It appears that my personal perception of religion as moral belief, rather than as acceptance of supernatural events misses something fundamental – while for Andy this distinction does not exist. Returning to the bible, he described how the apostles were offered “a glimpse of glory,” a phrase that he applies to his own revelation too. “Most of us don’t look further,” he suggested regretfully, spreading his hands and explaining that he sees the modern day in direct continuum with the biblical world, in which God’s wonders are literally manifest and miracles are possible. “I haven’t seen an angel,” he added with a tinge of disappointment, yet with the undeniable implication that it could happen at any time. Andy possesses a light touch, talking open-heartedly about big subjects without being borne down by them, while I was perplexed by his declaration. Yet I appreciate it is in the nature of faith to be inexplicable, and so I did not wish pursue my enquiry disingenuously, challenging what is sacred to him with casual scepticism. The world was still the same world to me, except now I knew that Andy embodies his role as rector, not just as the caretaker of a building but as a man with faith in the divine, inhabiting a spiritual universe that defies reason. I do not entirely accept the language of rational science myself, though I cannot make the leap of faith which religion requires either. God has not spoken to me yet. I must admit that as I listened to Andy describing his strange revelation, I envied the consolation that his belief has granted him just as I also know that such credulity is beyond me. Let me say, I was amazed to meet a man who believed in angels. How refreshing to hear of Andy’s experience in this very troubled world, and it was so lovely for him to share his experience with us as it is such a very special and personal experience. I love Spitalfields Church and my family regularly travel from Sussex to go to the wonderful music festivals which are held in the church and its locality. I’m sure that the local community must enjoy having someone like Andy as their Rector. Andy/Andrew as we know you! I met your brother Gavin in BH two weeks ago. I was very sorry to hear about Janice. He told me, very proudly, that you were at Spitafields church but shock & horror when I saw the picture of the church. Wow well done Andrew I am sure your family is very proud of your achievements. I was in London last weekend but did not have time to try and come up to Spitafields but now we know where you are we will keep in touch with your web site and if there are any occasions at your church we will attempt to attend. Lots of good wishes and hope to see you in the near future.